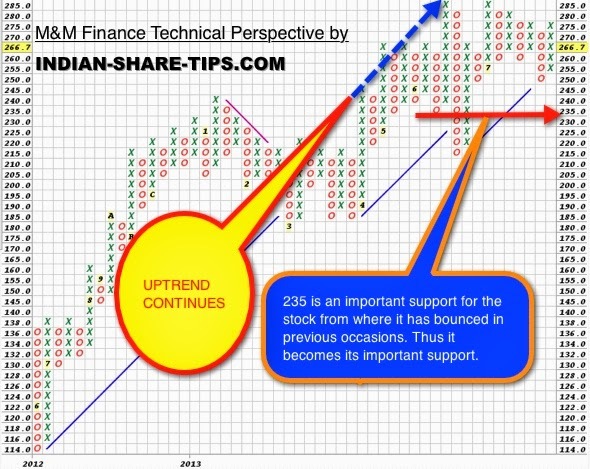 The below is a point and figure chart for M&M Finance and we are bullish on the stock as it has bounced from its support number of times from Rs 235 levels. The stock is within the rising trend. As an investor one can hold the stock for medium term. The stock has broken from a rectangle formation in the last month and it appears that stock will continue its march upwards. The point and figure chart looks a bit complicated than candlestick but once a technical analyst starts using it, the amount of inputs it provides is far superior than candlestick chart. One can be long in stock with stop loss of Rs 235 with target of Rs 273,280 and higher levels. Our clients are long in the stock. Do remember to be a part of our elite trading fraternity by going in for our short term delivery stocks or you can go for one stock for intraday for your daily intraday trading requirements. We believe in trading for a limited time with limited number of stocks. Do remember to share the post with your favourite bookmarking tool given below.